Thousands of firefighters battled blazes in northern and southern California on Tuesday as body recovery teams searched the remains of houses and charred cars for victims of the deadliest wildfires in the history of the US state. "We have teams -- you know, coroner teams -- that have to go house to house and vehicle to vehicle," Schuster told ABC. "There are 6,400 homes that were burnt. "That's a lot of homes they have to go through to ensure that there are no human remains there, not to mention the hundreds of vehicles that are burned out and just strewn all over the roads," she said. At least 42 deaths have been reported from the "Camp Fire" in Butte County and another two from the "Woolsey Fire," north of Los Angeles. Butte County Sheriff Kory Honea said Monday that search teams were using "cadaver dogs" to look for fire victims and two temporary military morgues were being set up. The "Camp Fire," which erupted on Thursday, has ravaged 125,000 acres (50,585 hectares) of land and is 30 percent contained, according to Cal Fire. The "Camp Fire" has destroyed more than 6,500 homes and 260 commercial properties. Battling the blaze are 5,100 firefighters, some from Washington state and Texas, backed by more than 600 fire engines and 21 helicopters, Cal Fire said. The "Woolsey Fire," which also began on Thursday, has razed 96,314 acres (38,976 hectares) and has been 35 percent contained. 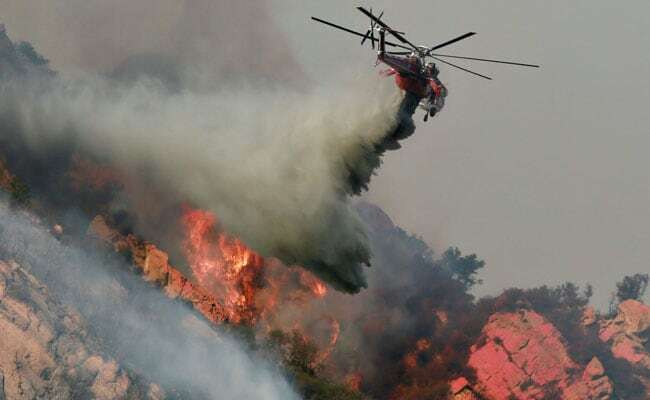 Cal Fire said 3,592 firefighters were battling the "Woolsey Fire" assisted by 22 helicopters. On Monday, President Donald Trump -- at the request of state authorities -- declared that a "major disaster" exists in California. Among those who lost their homes was the pop star Miley Cyrus, who tweeted that her "house no longer stands but the memories shared with family & friends stand strong."